Hallway testing is a usability test set-up in a high foot traffic area, utilizing bystanders to test your product. Your participants will be people who happen to be walking down the hall and are able to afford 5-10 minutes of their day. We on the USAJOBS team have found hallway tests successful for multiple reasons, most notably the number and variety of test participants available. In the five hallway test sessions we have conducted recently, we averaged better than thirteen participants per test. USAJOBS.gov is open to the general public, therefore we need to ensure that the website is usable for a large and diverse audience. Hallway testing has provided our team the opportunity to interact with a wider range of test participants. Choosing the optimal location for your hallway test is invaluable. Ensure your location will have heavy foot traffic. 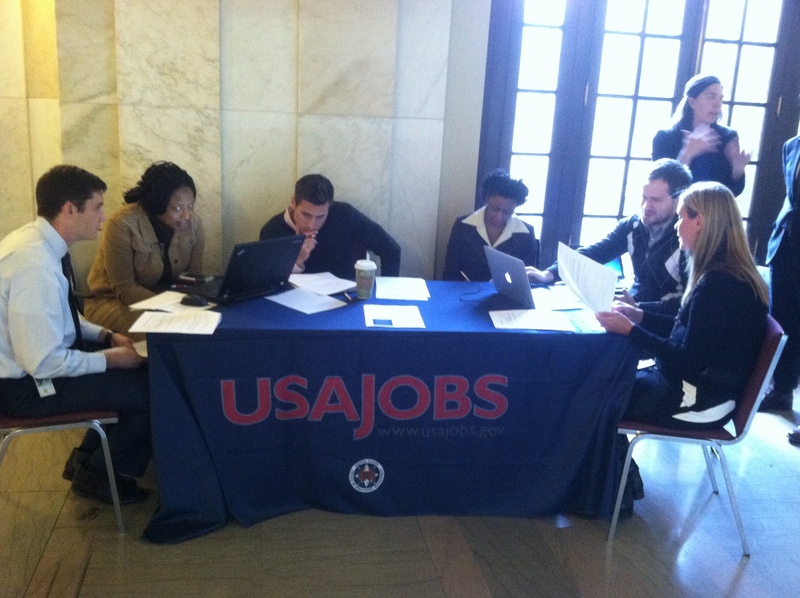 USAJOBS has had success in hallways leading to a cafeteria or entrance hallways. Be aware of the timing of your hallway test. Do not schedule hallway tests during inconvenient hours or major events. Don’t be afraid to attempt hallway testing outside the confines of your own building. We have had successful tests at other agency locations. As impromptu as hallway testing sounds, it takes a lot of planning. Consider putting together checklists for necessary materials and required steps to be taken. Preparation for a hallway test can start as early as a month before the actual test. Give yourself ample time to set up and get the testing team situated. You should arrive at least 30 minutes before you are scheduled to begin testing. Run through the test script multiple times and inform team members exactly what you are looking to identify during the test. It is key to inform team members about the duties of their role. At USAJOBS, we give all testing team members one of three guides that outline their role (Facilitator, Observer, and Greeter). Greeters play an important role during hallway tests, namely identifying and recruiting the test participants. It is important to have outgoing and determined greeters to get people involved in the testing sessions, some personalities are better suited for this task. The optimal time for an individual hallway test is 10 minutes. A tester’s focus and interest tend to wane if you keep them any longer. Remember that your test participant is volunteering their time, be conscious of their schedule. Let the tester know the ultimate goal of the hallway test. They have agreed to the parameters you have set for the test, do your best to keep them focused on the task at hand. Participants are volunteering part of their day to aid your product, you should reward them for their kindness. In the federal space there is regulation about how you can reward testers but simple gestures can still be made. At USAJOBS, we often hand out pens or chocolate. Even if you can’t give a reward, be thankful, patient and answer questions or concerns after the test is completed. When running tests consecutively, the observer and facilitator should always have a brief review after every test to ensure they are capturing all the data. Always be aware of how you can improve your testing processes. A team debriefing session should be a requirement after hallway testing sessions. Hallway testing can seem like a daunting task for those starting out. Fortunately, the best way to learn the process is through trial and error. Attempting a hallway test will provide valuable feedback on your product while illuminating improvements that can be made to your testing process.